Why is it called a Spyder? A Can-Am ? Where can I see and try one ? Who will sell them ? Where is my nearest dealer ? Will there be other model colors ? What type of driver's license is required ? Is it considered a motorcycle ? How would you compare it to driving a 2-wheel motorcycle? How does it ride ? Will there be more than one model ? Do people need to wear a helmet ? What kind of warranty do you offer ? Is it a 2-up ? Does it meet EPA / CARB / EU / etc. regulations ? Why is it called a Spyder? A Can-Am? It's called a Spyder roadster. It is built by BRP under the Can-Am brand. 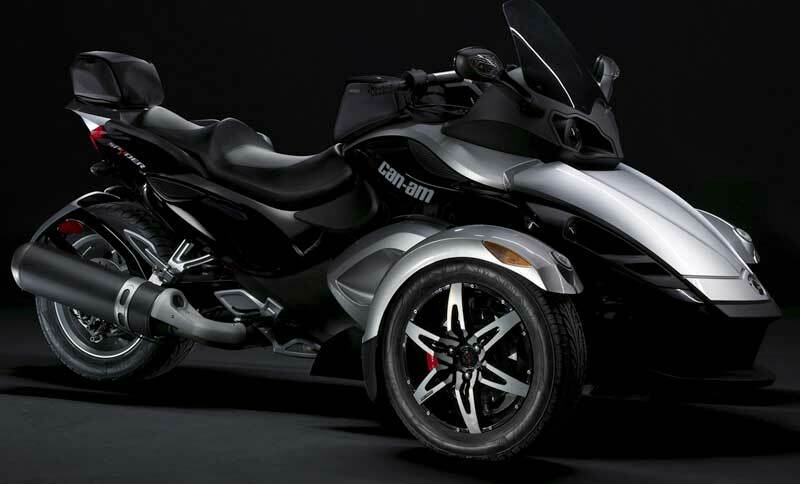 The Can-Am brand is BRP's wheeled vehicle brand which includes all-terrain vehicles and Spyder roadsters. The Can-Am brand stands for a connection between performance and agility and a balance of style and strength. The Spyder aligns perfectly with these brand attributes. Where can I see and try one? 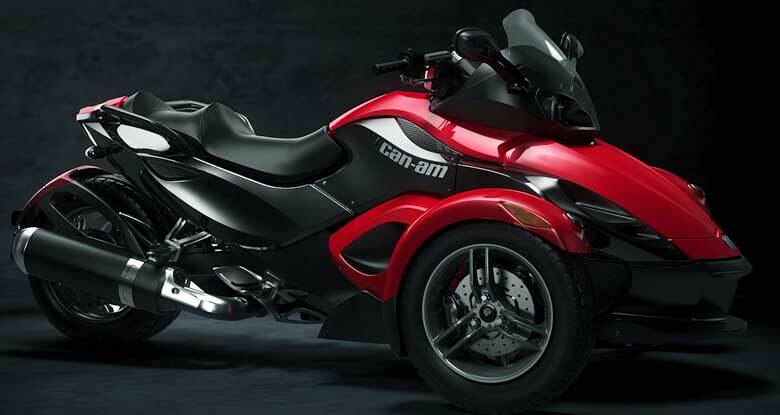 There are now many ways to see or try the Can-Am Spyder roadster. You can attend Spyder Tours which are divided into Demo tours (closed circuits and on road) and Dealer Demos. Or, you can attend Spyder Events that are organized by the BRP Can-Am Spyder community. Activities planned for Spyder vary, though most will involve riding with other Spyder owners and enthusiasts. For a complete list consult the "Try a Spyder" section. There are authorized Spyder dealers in North America and in Europe. BRP started its phase 3 Spyder market availability, which means 49 states, ten provinces and about 20 international markets now have Spyder dealers. The roadster's worldwide deployment is scheduled to be completed within the next two to three years. Note: Any offer to purchase, order, offer for sale, sale or transaction will be subject to the compliance of the Spyder roadsters with all governmental regulations and to the receipt of all required licenses and authorization. BRP is accelerating the worldwide deployment of its Can-Am Spyder roadster in response to strong market demand. Please take a look to the " Find a dealer section " to find the nearby dealership in your area. 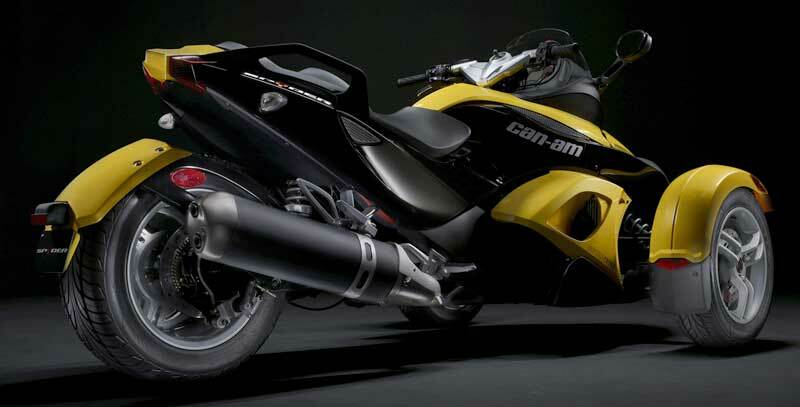 The Can-Am Spyder SM5 MSRP will start at £TBA and the Can-Am Spyder SE5 MSRP will start at £TBA. Millennium color option is additional £TBA. Please note that MSRP does not include freight, taxes, licensing, registration and pre-delivery inspection. For information regarding pricing outside of the United States, please visit your specific country site. Presently, three colors option (Millenium Yellow, Full Moon Silver and Roadster Red) and two transmission options (sequential manual and sequential electronic) are offered in addition to a full line of accessories. However, BRP is committed to developing a full lineup of Spyder roadsters. Consider this first Spyder just like the 1958 Ski-Doo or 1988 Sea-Doo... It's just the beginning! Most jurisdictions require a motorcycle or three-wheel license to operate the Spyder. In California and Delaware, consumers would only require an automotive license to operate Spyder. In most European markets, consumers will need an automotive license to ride Spyder. Specific information by jurisdiction is provided under the section "Need to know". Is it considered a motorcycle? In North America, the Can-Am Spyder is classified as a motorcycle. BRP refers to it as a roadster since it offers all of the open-air benefits of a motorcycle together with some of the peace-of-mind offered by a car. The Can-Am Spyder roadster brings BRP's powersports experience to the road, and will open up the road to many users who want that type of experience. We considered other configurations, but found that the Y stance of the Spyder offered a unique architecture which provided a balance of performance and peace-of-mind riding with features like the Vehicle Stability System (VSS). What sets Spyder apart from anything on the market is what is integrated in the VSS: the Anti-lock Brake System (ABS), the Traction Control System (TSC) and the Stability Control System (SCS). How would you compare it to driving a 2-wheel motorcycle? How does it ride? It's a different experience, it doesn't compare. This is a new kind of roadster, with a three-wheeled geometry, two wheels in front and one in the rear, Spyder offers a balance between performance and peace-of-mind. Will there be more than one model? We are creating a family of vehicles, and there will eventually be other models. As with any BRP product, Spyder will evolve but the core of the product is something that will remain the same. Do people need to wear a helmet? While helmet laws aren't universal, BRP recommends everybody wear a helmet while riding the Spyder. Please refer to your State or Provincial jurisdiction for specific requirements. We offer a two-year limited warranty. Exceptions apply. See the full warranty text for details. Yes. Spyder is categorized as a sport touring roadster and it has the ability to carry a passenger. Does it meet EPA / CARB / EU / etc. regulations? Yes. The Spyder roadster meets or exceeds all EPA/CARB and Euro-2 environmental regulations. February 20, 2007 BRP has unveiled its first "on-road" vehicle, the 2008 Can-Am Spyder roadster. This three-wheel vehicle, with two wheels in the front and one in the rear, offers a completely new and stunning look. Powered by a proven 990cc V Twin engine designed and manufactured by BRP-Rotax, Spyder roadster, with its unique Y-architecture, can be described as part motorcycle and part convertible sports car. Later this year twelve selected American states and four Canadian provinces will offer Can-Am Spyder roadsters through BRP's existing dealer network, followed by France and Spain in early 2008. BRP will then expand its Can-Am Spyder offer to more North American states, Canadian provinces, Europe and other countries, and expects to be present worldwide within three to four years. "Our Can-Am Spyder roadster is the next dimension in open-road riding. A true paradigm shift, the Spyder roadster offers a balance of performance and peace of mind with features like the Vehicle Stability System (VSS), engineered in conjunction with Bosch†, which includes anti-lock brakes, traction control and stability control systems," said José Boisjoli, president and CEO, BRP. BRP's reputation was built on its ability to innovate and design products for powersports enthusiasts. After more than five years of research, the Can-Am Spyder roadster is now delivering on the company's promise to offer a complete line of recreational motorized products in four segments: on snow, on water, as well as both off and on road. While confirming that the Can-Am Spyder roadsters would be assembled in Valcourt, Boisjoli added: "This is a historic event for BRP, particularly for our Valcourt and Austrian employees, as it confirms the strategic role of BRP's Québec manufacturing facilities for assembling complex and sophisticated vehicles, and BRP-Rotax's leadership in engine development. With Can-Am Spyder, we are redefining the roadster category by bringing the powersports experience to the road through this new generation of vehicles. BRP is entering a new era that will provide growth opportunities for our company worldwide and potentially create new jobs,'' he concluded. Plans are to start manufacturing units by fall 2007 with a progressive ramp-up of the production over the next three years to meet market demand. "This event also marks BRP's first truly global launch," said Chris Dawson, vice-president, Strategic planning & Head of Can-Am Spyder Program. "In 2007, BRP will deploy the first phase of its go-to-market strategy: twelve selected American states and four Canadian provinces will offer Can-Am Spyder roadsters through BRP's existing dealer network, followed by France and Spain in early 2008. In its second phase, BRP will expand its Can-Am Spyder offer to more North American states, Canadian provinces, Europe and other countries, and expects to be present worldwide within three to four years," he concluded.